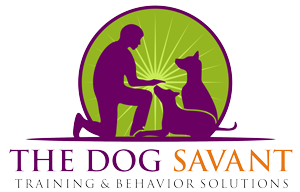 Dog and Puppy Training Success Stories | The Dog Savant Serving Southern CA. “We’ve been very happy with the services Brett has provided! We have a 130lb Berner under a year old! Before coming to Brett, I tried several methods to train my dog, from things I read online to spending hundreds of dollars on trainers using the clicker-treat method, and 2 different harnesses per their recommendations. None of these methods were successful. My dog was more interested in playing than the treats, and no one promoting this bribery method, was willing to look at other options. I have a degree in brain behavior and cognitive science, I fully understand the theory behind the reward based training, and I agree it works for some dogs. But for us it simply wasn’t successful; our dog’s progress was very slow and inconsistent. While this seems like a minor problem, a 130lb dog bounding at people and other small dogs is alarming and frightening to people who don’t know he’s friendly! And sooner or later a 130lb cart pulling dog was going to pull me right into a face-plant. I was so relieved when we found Brett. Finally! Someone who focused on what motivates our dog, and was willing to implement some structure instead of trying to bribe him with treats he didn’t even want. We were able to focus on building respect and boundaries by being firm leaders/owners. Yes, Brett is passionate about what he does, and I personally appreciate that. He cares about our dog and wants to see us succeed, and sometimes that requires telling us when we’re doing something that doesn’t facilitate/promote positive behavior. I can’t tell you how many compliments we get on how well behaved my dog is for still being a puppy; something I NEVER heard before while we used treat-reward training. We’re very pleased with Brett’s services. He’s always flexible with our schedules, he offers free group training weekly, and he makes himself available if we have questions/concerns.” Aimee E.
“When our Jack Russell Terrier was still a puppy, we began to walk her on a leash outside. She would stop and yank, refusing to move, and no matter what we did she acted like she didn’t want to walk with us. This was disheartening because the big reason we got a dog was to have a walking or jogging buddy! We took her to Brett for a consultation. He told us that our puppy didn’t trust us, so she was freezing up on walks. We needed to earn her trust. We went through a 6-session training program with Brett and solved the problem! Not only did Brett show us the way to earn our dog’s trust by demonstrating our leadership, but he showed us how to get her to sit, stay, and come on call. Our dog is very stubborn, but Brett’s methods worked the first time and ever since. She is not the hyper, anxious dog she may have been if we didn’t establish our leadership and inspire her calmness. She is such a good dog. People are AMAZED at how calm, happy and content our JRT is!” Margeret E.
“I took my “troubled” dog to Brett after thoroughly researching dog trainers in the area. I have been very happy with the results! Not only has my dog been learning, but I have as well. I have a better understanding of the dog world and my dog better understands what I want from him. I have tried many trainers over the last few years, my family loves our dogs, and Brett gets results that I have not seen equaled. I appreciate his years of study, his dedication and his straight talk.” Vicki P.
“Brett is the BEST dog trainer I have ever met! 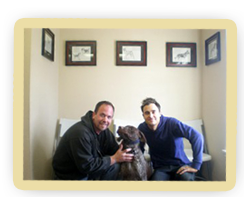 If you have a more difficult/challenging pup, or you want to train your dog the “right” way…Brett is your man!! !” I can’t say enough great things about him. Worth every penny spent and then some! P.S. the weekly group classes are priceless. 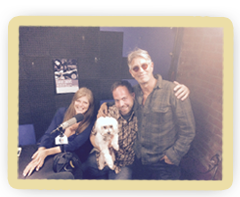 Thank you Brett…our little Lati girl thanks you too.” Joy B. “Brett has changed our dog world and is the best trainer for us and our very smart puppy Dobby! Give him a call so you can find that joy in a great companion dog!” Margot W.